How much does it cost to travel to Villach? How much money will you need in Villach? €93 ($105) is the average daily price for traveling in Villach. The average price of food for one day is €28 ($32). The average price of a hotel for a couple is €110 ($123). Additional pricing is in the table below. These average travel prices have been collected from other travelers to help you plan your own travel budget. 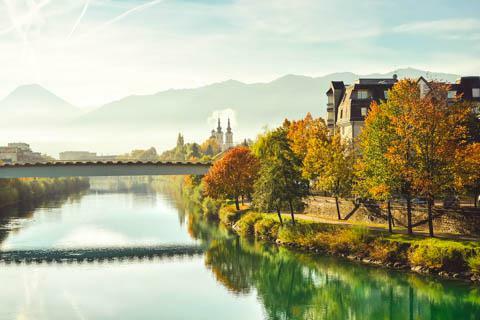 Located on the Drava River in the Austrian province of Carinthia, near the Italian and Slovenian borders, the city of Villach is known as a gateway to nearby lakes Faak and Ossiach, as well as the Villach Alps. Hiking and water sports are common in the surrounding area, as well as historic sight-seeing and enjoying the picturesque town center called Altstadt. One of the best rated sights of the area is the Landskron Castle, which encompasses the remains of the old fortress of Landskron on the top of a hill. Though much of the castle was destroyed by a fire in the 19th century, there are still some parts that can be visited - some of which include a restaurant (with occasional medieval themed dining), and a home for birds of prey who take part in a falconry demonstration depending on the season. From the castle, views consist of Villach and the valley of the River Drava with its lakes, as well as the Slovenian Alps on the other side of the valley. As far as views go, some of the best can be found along Villacher Alpenstrasse. This nearly 20 kilometer alpine road climbs Dobratsch Mountain, ending at 1,732 meters. For those hoping to reach the top, there is still a good bit of climbing from this point, since Mount Dobratsch peaks at 2,167 meters high. Lake Ossiach is another beautiful setting for a day on the water. Here there are a number of quaint villages, as well as a church and monastery (first built around 1000 AD) for which the lake is named. Other interesting attractions include Villacher Fahrzeugmuseum for antiquities and other artifacts, Museum der Stadt Villach for local history, the bell tower of Saint Jakob, and a Museum of Doll Art. A small Austrian town with roots that date back to Roman times, Villach has a number of historic locations situated around an old picturesque town center (known as Altstadt). The Main Square, known as Hauptplatz, cuts across the middle of the old town and is lined with a number of shops, bars, restaurants, museums, and places to stay as well as a Trinity Column built 1739 to commemorate deliverance from the plague. Heilige Kreuz church, not too far from the square, is among the most beautiful sacred Baroque-style buildings in Austria. Hauptplatz is the best place to shop, though there are also malls located outside of Villach (along Mariagailerstrasse). Activities in Villach range from hiking amidst the magnificent Alpine landscape to water sports on the lovely nearby Lake Ossiach. There are even a few hot springs - one of which is called Maibacherl and only appears in the spring. Located in Warmbad near Villach, this spring has water is hot enough for bathing and is very popular with the locals, with a reputation dating back to ancient Roman times. Other happenings include things like cross-country skiing, ice skating, climbing (Kanzianiberg), local festivals (like Jazz over Villach), golf (Alpe Adria Golf), and just about any lakeside activity imaginable. In addition to Lake Ossiach, Faak Lake is another common body of water to visit featuring some of the cleanest water in Europe. The cuisine of Austria varies depending on the region; however, dishes are generally composed of influences from throughout the former Austro-Hungarian Empire. Regional differences are usually significant from nearby nations like Italy, Hungary, Bohemia, Germany, and the Balkans, which have had an effect on Austrian cooking. As a part of the Austrian province of Carinthia, Vollich is a prime location for the fresh fish available in the abundance of nearby lakes. Grain, dairy produce, and meat are also important ingredients in Carinthian cuisine. Some well-known local delicacies include Carinthian Kasnudeln (noodle dough pockets filled with quark and mint) and the smaller Schlickkrapfen (mainly stuffed with a meat filling). Also produced locally are dishes like Klachlsuppe (pig's trotter soup) and Reindling (yeast-dough pastry cake filled with a mix of cinnamon, sugar, and raisins). As mentioned earlier the best selection of restaurants, bars, and cafés will be found in Villach's main square, Hauptplatz. By plane, the nearest international airport is Flughafen Klagenfurt Airport in Klagenfurt, located about 40 kilometers from Villach. By train, Villach is a railway gateway in Austria, so trains go between most every big city, including places like Vienna, Graz, Klagenfurt, Salzburg, Linz, Innsbruck, and Bregenz. There are also direct connections to Munich, Zurich, Venice, Ljubljana, Zagreb, and Belgrade. Once in town, it is fairly easy to get around on foot.